An important aspect that every SEO professional out there ought to keep in mind is that gaining the trust of Google is not a child’s play. And it doesn’t happen overnight. So, if any SEO service provider promises you to help you reach the top within a fortnight, you have to be convinced that you are being taken for a ride. In simple words, there are no shortcuts to the first spot in Google search result page and there are no quick fixes. So, just hang in there and find out how you can win the trust of the search engine major, namely, Google. In this write up, we will focus on the rules or rather norms that can help you to stay on top when it comes to SEO ranking and search results. 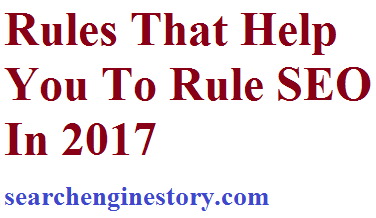 • Rule No 1 Hard work and smart work helps– In majority of the cases, it has been observed that SEO professionals think that it is easy to master SEO tricks and a little effort will suffice. But it is just the reverse. You have to put in a lot of hard work in order to get the minimum return. Of course this holds true for the initial stages, when you have just taken the plunge. But even when you become a veteran, hard work and smart work will yield all the desired results and not just manipulating SEO strategies. • Rule No 2 Website’s Indexed age matters – If you have taken the plunge, you will have to exercise a lot of patience and perseverance. In the event your website has been indexed several years ago, your website stands a better chance of being recognized. But aside from indexed age, the content, nature of links that you have been dealing with all these years, counts to a great extent. • Rule No 3 Quality and not quantity is essential – Time and again, Google has conveyed this message ever since SEO struck roots. In fact, in order to further substantiate its principle, Google introduced Panda algorithm since it was not very happy the manner in which users were being forcefully diverted to websites that sell services and products. Most importantly, there were also certain affiliate partners that were tempting users to invest in their services and products. The same holds for content. By introducing several updates of its algorithm, this search engine major has proved that regularly updated, relevant, organically receiving web traffic and websites that offer great user experience deserves the best spot in search engine results. • Rule No 4 Don’t encourage thin content – Thin content refers to content that is short in length and does not add value to the user experience. This can be explained in the following manner. For instance, if you have content that contains information about an illness or a topic that offers the opportunity to write pages on it and if you just wrap up the article in 500 words, it is referred to as thin content. Google considers this content as incomplete and in the words of experts “content without meat on bones”. • Rule No 5 All about keywords – It is a well known fact that keywords form an integral part of SEO. But Google wants that keywords ought to be incorporated for human beings and not web crawlers. However, it is not saying that search engines have to be avoided fully but the SEO professional has to strike a fine balance between writing content for human beings and search engines. Keywords can be undoubtedly included but with a meaning and it need not clutter the content where it is not required.